Quality By Vision’s BTE-100 – Buckle Tester for Seamed Ends is an automatic, easy to use pressure tester for three-piece seamed cans. The system includes a computer with software that automatically detects the pressure points and displays the can deformation at each stage. The hardware consists of a robust pressure chamber with a protective door and multiple safety features. The operator positions an empty can inside the pressure chamber and locks it in the holding mechanism. As soon as the safety door is locked, the operator presses the Start button to begin the measurement. Controlled air pressure is provided from the bottom and the pressure is gradually increased until all beads have buckled. A non-contact gauge is used to measure the deformation of the seamed end. A video camera records the buckle process and can display each stage. 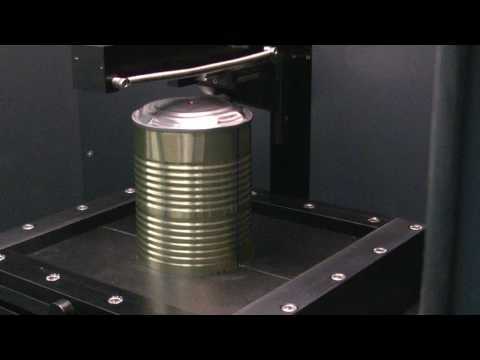 Live video displaying the can. At the end of the measurement, the software automatically detects and displays the buckle points for each bead on the graphs. As a verification to the automatic detection, the operator can replay, rewind and fast-forward through the measurement process and see an image of what the can looked like at that point in time. This allows operators, for the first time, to actually watch the buckle process in slow motion, to see how the end reacted to the pressure! Operators can now see for the first time, the initial small deformations as they occur at the beginning of the pressurization. The graphs and the reports are saved and can be displayed at any stage after the test. The software also includes a robust SPC system to display trends, histograms and capability statistics. Video records the buckle process in slow motion to allow for troubleshooting! The BTE-100 is the only pressure tester for seamed food ends that has the flexibility and the features to help you locate problems and fix them before they become serious issues.